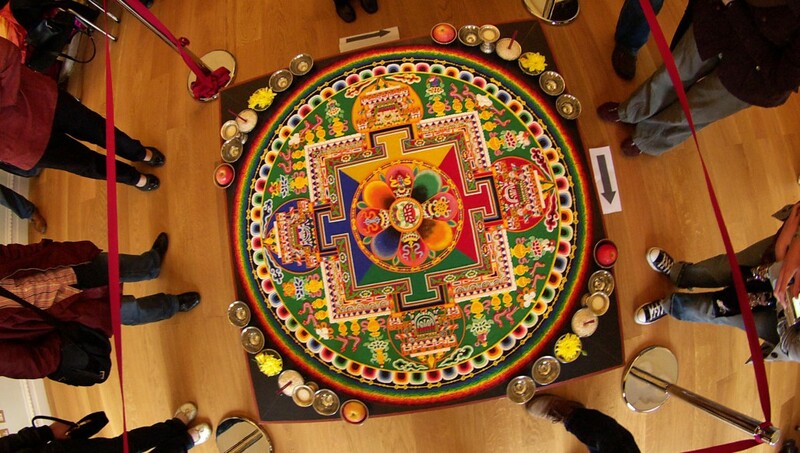 From Monday 27 June Tibetan monks from the Tashi Lhunpo Monastery will be creating a colourful Sand Mandala in the Garden Room at Gold Hill Museum. This beautiful but short-lived work of art represents a Buddha’s palace and is composed of millions of grains of coloured sand, painstakingly put into place using hollow metal funnels called Chagpurs. The monks can be seen at work during normal opening hours 10.30a.m. to 4.30p.m. and there is no charge. On Thursday at 6.30p.m. there will be a talk about the Monastery and the Sand Mandala; tickets can be collected from the Garden Room. The monks’ residency concludes on Monday 04 July with a ceremony starting at 10.30a.m. in which the completed design is ritually swept up and dispersed. Tickets for a 7.00p.m. Monday 04 July performance by the monks of sacred music and dance in Shaftesbury Town Hall are available online at Eventbrite.com and from “Nature’s Treasures” in Shaftesbury High Street.